While the BBF working groups are divided across topics, challenges and ways forward often overlap, and this summary aims at giving a first glimpse of what the Roadmap may include. 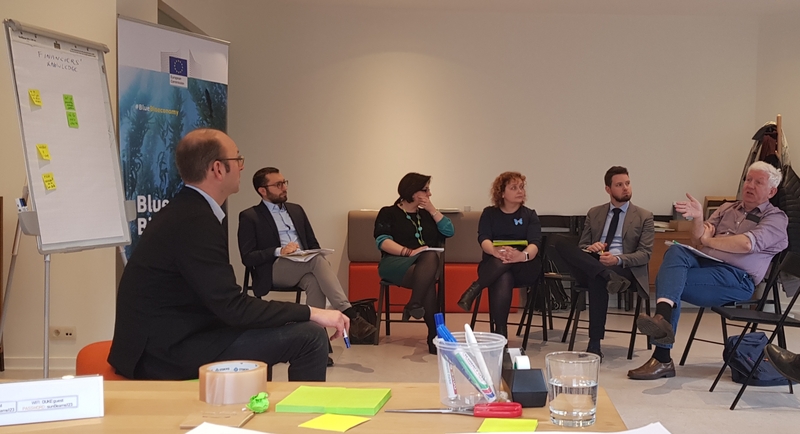 The Blue Bioeconomy Forum held its second working group meeting on 11 and 12 March in Brussels. Participants attended four half-a-day sessions dedicated to each working group: Policy, Environment and Regulation; Finance and Business Development; Consumers and Value Chains; Science, Technology and Innovation. These discussions were instrumental in gathering more insight on the key challenges and ways forward identified over the last year, finding the good examples to illustrate potential solutions. As we are about to launch the next phase of our consultation process, the results help us frame the Roadmap for the Blue Bioeconomy. Looking back at the discussions we had during this workshop, below are some of the most interesting solutions that came out of the different sessions. While the Blue Bioeconomy Forum working groups are divided across topics, challenges and ways forward often overlap, and this summary aims at giving a first glimpse of what the Roadmap may include. As for many emerging sectors, there is a strong need for more (tailored) information of all kind. Information on the natural capital is needed to promote a sustainable use of the resource, and use it to provide ecosystem services. Project holders with a predominantly research background need business skills to bring their results to the market, but they also need to know when best to apply them. Companies need information on different production process, to assess which one is the most efficient under which condition, especially when setting up their activities. New companies also need appropriate information on the licensing and permitting procedures in their area, to anticipate costs, timeframe, etc. and consequently convince investors to fund them. Businesses also need adapted guidelines on key regulations, namely the Novel Food application procedure, to be able to bring the best ingredients on the market. In parallel, public authorities need more input to understand how to streamline procedures while guaranteeing a good regulatory level. In short, there is a need for more data, more guidelines, and more sharing of what already exists. But how to best share everyone’s knowledge and good practices, and make sure that it translates into concrete results? Participants discussed past experiences. While an EU-wide knowledge hub could help centralise all available information in the same place, there is a need for more local gatherings. Clusters were especially identified as the proper place to bring together an often scattered community, at regional or national level, to enhance exchanges between different actors (researchers, companies, policy makers and intermediaries), building the right teams and creating a shared understanding within the community. This would help improve the regulatory environment, making it easier for public authorities to provide adapted guidelines. It would also help research projects to include the right advisors from the business community to enhance technology transfer. Clusters can also make it easier for project holders to pull resources, for example, sharing infrastructures to reduce upfront costs, or starting joint applications for novel food authorisation. However, structuring a community does not happen overnight or with goodwill only. Strong support from public authorities is needed, at all level. In particular, regional and national authorities can play a pivotal role, especially as part of their smart specialisation strategies. They can help nascent Blue Bioeconomy businesses find their place in their local environment, by including them in spatial planning processes. They can also support them accessing infrastructures and benefit from cross-regional value chain opportunities to fill-in gaps and needs. Depending on their administrative prerogatives, they are best placed to provide support in applying for licenses and funding, and direct the attention of business intermediaries to these specific companies that need tailored support to apply regulation to their niche area. They are also at the interface with the general public, both consumers and citizens. The Blue Bioeconomy can help rural and costal communities find new activities. The active participation of local constituencies is key in choosing the right activities, those that can help restore degraded landscapes, create and retain local jobs, while limiting conflicts with existing sectors. Beyond specific localities, cities and regions can also build national and transnational networks to support the Blue Bioeconomy. As many activities can happen further inland, such as microalgae biorefineries, there are gains to be made from informing these regions without a coastline of these inland, yet blue opportunities. And for those that are already investing in the Blue Bioeconomy, building peer-learning platforms similar to the smart specialisation platforms could, for example, help find the most efficient ways to use public, and especially European funding. To conclude, there are many solutions out there to help the Blue Bioeconomy sector develop to its full potential. While having its own specificities, there are lots of good practices to be learnt from other sectors, such as the insect-based food and feed, but also less similar ones such as digital transformation.